Founded in 1956 through the entrepreneurial spirit of Frank Rice, Rice Tool and Manufacturing Inc. to this day not only continues to proudly bear the Rice family name but also Frank's unwavering dedication and vision to manufacturing. With over 50 years of success serving the manufacturing sector, Rice Tool and Manufacturing Inc. has a global reach, supplying components to OEMS and various tier suppliers throughout North and South America, Europe, and Asia. Combined, our two facilities offer in excess of 45,000 square feet. In addition to our medium and high volume CNC production department, we also offer a fully equipped tool room to provide both internal around-the-clock technical support for our production equipment as well as to offer competitively priced and technically advanced solutions to our customers' fixture, work-holding and tooling needs. To further support our valued customers, Rice Tool Manufacturing, Inc. offers a comprehensive list of value-add services, including assembly, packaging, CMM verification, CAD design, and production support services. Rice Tool and Manufacturing Inc. maintains certification from ISO/TS 16949 (3rd edition), Government of Canada Services Controlled Goods Program (CGP), and NATO standards. 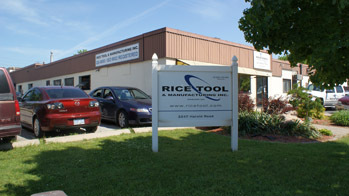 Rice Tool and Manufacturing Inc. is conveniently located for air, land, and water travel. The Port of Hamilton is less than 30 minutes away, Pearson International Airport is within 40 minutes' drive, and the Canada-US border crossing at Fort Erie/Buffalo can be reached in about an hour.